Awhile ago I had been searching for volunteer opportunities throughout Cambodia. Most of the projects I had found were going to cost me and I honestly don’t believe in paying to volunteer. The essence of volunteering is that you are giving back to a cause that you believe in, helping those less fortunate, and assisting in making the world a better place. You shouldn’t have to pay to do a good deed. After planning my itinerary for the next couple months, I realized that volunteering might not be an option because of my short time in each city and country. But to my luck, I did in fact get the wonderful privilege of lending a helping hand in Phnom Penh. 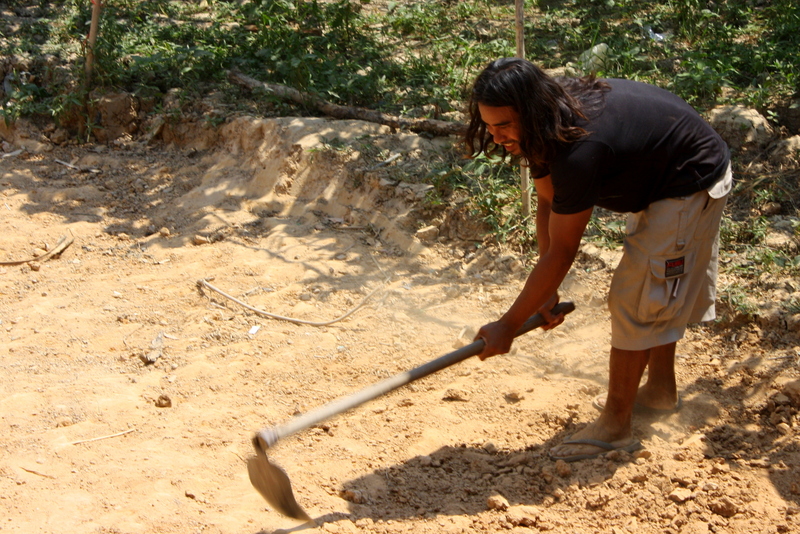 My couchsurfing host had a friend named Isaac, who was building a school in a local village and was recruiting volunteers (he was also recently feature in Asia Life Magazine, click here to read the article). I wasn’t quite ready to leave Phnom Penh and decided right away that I would love to help out any way I could. 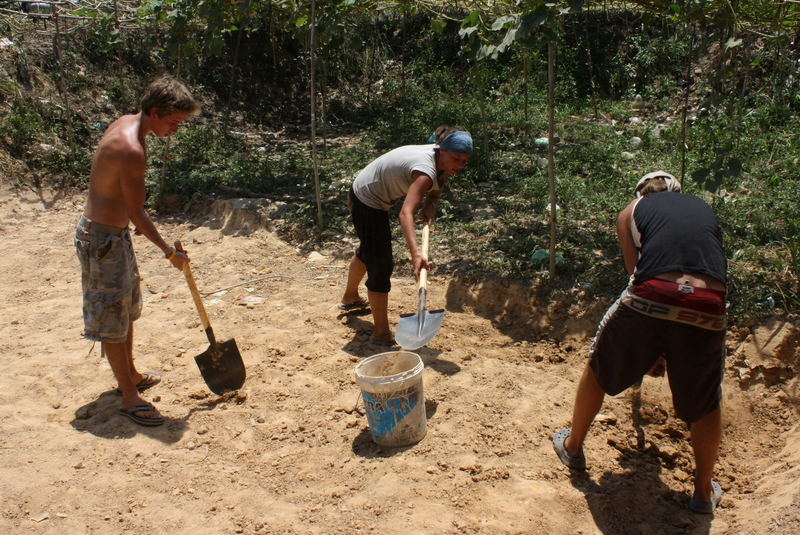 The task: Digging a ditch where the water during the wet season(only a month away) would drain so that the children had a place to play. Yes, I would be digging a swimming pool-size ditch on my vacation (well, I wouldn’t personally dig the entire thing, that would be impressive!) and I couldn’t be happier. Getting a workout in the dirt! The school construction site was located in the South Central (Isaac had lived in California at one point and used this to give me an idea of the type of neighborhood he had chosen for the school, which also indicated the reason why he chose that area) of Phnom Penh. He had suspended classes until the children of the village had returned the tools they had stolen from him (he pointed to the smallest, cutest little girl and told me that she was one of the culprits who stole a ball and said “Can you believe it?? The littlest girl was in on it!”) and the volunteers were to focus on digging the ditch. Even though I only was able to volunteer one day, I absolutely loved it. And I know what you’re thinking. You enjoyed digging in the hot sun, especially with a bad back? And no, I did not enjoy that part, but I loved the atmosphere. A bunch of twenty-something travelers getting together to help something bigger then them. Dedicating time they could be using gallivanting around the world to shoveling dirt all day. I highly recommend getting your hands dirty when traveling. Its rewarding and can really enrich your cultural experience! If anyone knows of anyone who needs help, or who has experiences volunteering, in Laos, Northern Thailand, or Vietnam, please send along their information to me so that I can maybe contact them when I’m traveling! I would love to keep volunteering, even if it is only for a moment! What a beautiful thing you did! My New Year’s resolution is to volunteer more. Thanks for the inspiration. Your trip is mirroring our plans in so many ways. We are also very keen to get involved with volunteering opportunities, but wary about the many companies asking you to pay to volunteer. We’re hoping that more deserving causes, happy to accept our time and efforts without payment, will present themselves as we travel. I’d love to hear about any causes / projects you come across that might need our help when we get there.